We run into fellow whisky geeks quite often in the San Francisco Whisky Shop, which, although a bit on pricier side, makes up for it by giving a wider selection of scotch than anywhere in San Francisco. 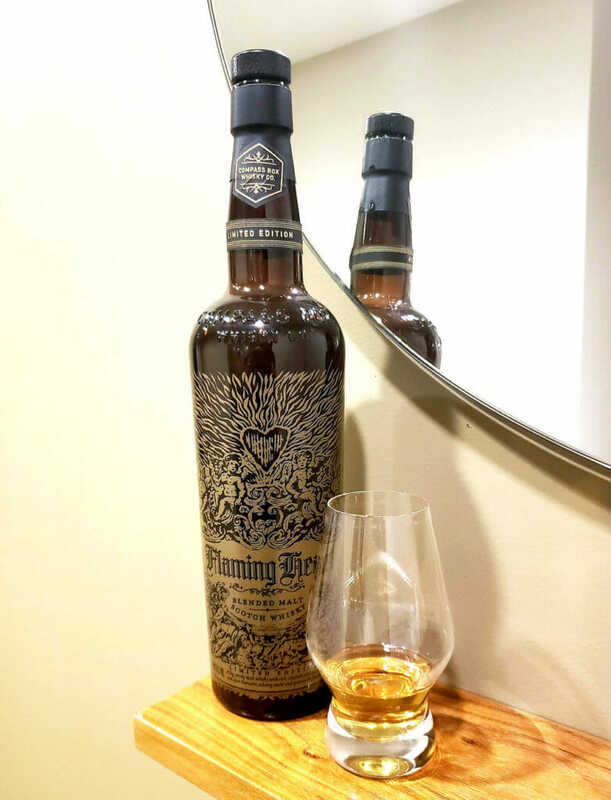 We got to chatting with a few enthusiasts who lead the San Francisco Bourbon & Scotch society and our new friend recommended the Flaming Heart upon hearing that I was very into peaty whiskies. I have honestly tried time and time again to love this whisky, but the oak and dust are off-putting and I wish there were some more sweet to balance out the peat. Overall: The nose is lovely and misleading – it smells like grilled fruits and dried peaches. But the first sip is instantly a pop of peat, cloves, and smoke, with underlying vanilla and lemony-lime notes. The end is what I have difficulty with: it fades into a pucker of library books and dry pencil shavings, which then turns the sweetness to taste a bit like peach Splenda. It puzzled me at first why I could not bring myself to like this whisky. I love Islay and the majority of the 15th anniversary (2015) edition of Flaming Heart is Caol Ila (38.5% 14 year Caol Ila and 27.1% 30 year old Caol Ila, to be exact). I suspect it has to do with the new oak that is not my flavor profile of choice, it leaves as lingering dusty heat at the back of my throat. Water brought out more nectarine notes for me, and I liked it far better with the addition of water. Edit*: Since polishing off the bottle, I have identified my challenge with the whisky. I typically love Laphroaig and Lagavulin bottlings that have a fruity or a caramel sweetness that counteracts the peat. The major “fruit” note of Flaming Heart is instead a lemon-lime counterbalance. Description: If you like the oak bomb and smoky old library book taste of old bourbons and the sweet peat of Islay, this is an excellent combination of the two. It’s very powerful stuff. But I’m not a huge bourbon drinker and wish there wasn’t the dryness of soot on the back palette. This whisky gets rave reviews. As a peaty Islay lover, I expected to love it. So when I first tried it, I think I set my expectations too high and was baffled. I tried again several times since then, and while it is growing on me, my initial thoughts (captured below) were not favorable. Was in trouble with the Scotch Whisky Association for declaring the exact composition of the whisky blend. It is comprised of: 38.5% 14 year old Caol Ila (refill American hogshead), 27.1% 30 year old Caol Ila (refill American hogshead), 24.1% Clynelish (rejuvenated American hogshead, in which the process of rejuvenation involves milling out the inner portion to expose new oak), and 10.3% blend of Clynelish, Teaninch, and Daluaine in “highly active” new French oak.